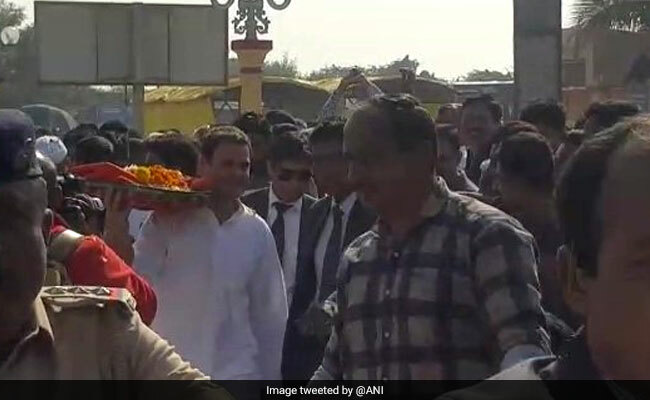 Rahul Gandhi Gujarat Visit Highlights: Rahul Gandhi, who campaigned extensively and aggressively in Gujarat for the Assembly elections, will address a gathering after the 'chintan shivir' (introspection camp). Mr Gandhi will meet newly-elected MLAs as well as leaders from Gujarat's four zones -- north, south, central Gujarat, and Saurashtra -- separately for four hours in Ahmedabad today, before addressing the gathering of party workers in the evening. Rahul Gandhi will begin the day with a visit to Somnath Temple. Ahmedabad: Rahul Gandhi met Congress leaders in Gujarat, who have already begun analysing the election result, to review and get insight about the electoral outcome. Gujarat Congress organised a three-day conclave, which ends today, to study the poll results. During the 'chintan shivir' (introspection camp), Congress leaders and workers in Gujarat have analysed the district-wise election results and will discuss the road-map ahead with party chief Rahul Gandhi in view of the 2019 Lok Sabha election. In the elections, the results for which were declared on December 18, the Congress could not wrest power from the BJP even though its tally increased to 77 seats from 61 last time (2012). 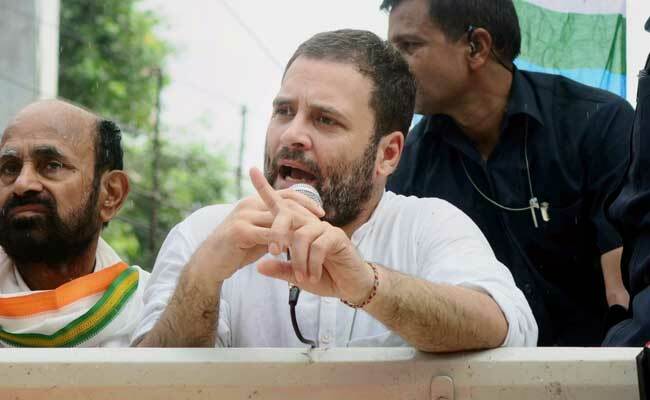 Rahul Gandhi, who campaigned extensively and aggressively in Gujarat for the Assembly elections, addressed a gathering after the 'chintan shivir' (introspection camp). Mr Gandhi will meet newly-elected MLAs as well as leaders from Gujarat's four zones -- north, south, central Gujarat, and Saurashtra -- separately for four hours in Ahmedabad today, before addressing the gathering of party workers in the evening. Rahul Gandhi will begin the day with a visit to Somnath Temple. 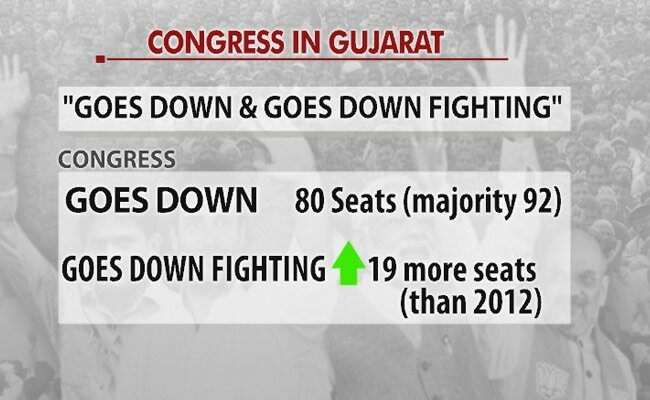 Rahul Gandhi said that if the Congress in Gujarat believes it can win elections, then it will win. Mr Gandhi also said that he was confident of winning 135 seats in the next Gujarat elections. He urged party workers to counter the BJP and to not retreat for the next Gujarat election. Congress President Rahul Gandhi said people had questioned, 3-4 months ago, whether Congress could even contest elections in Gujarat. He also said that action would be taken against those party members who did not fight with the Congress. He said that the BJP and PM Modi had run a defamation campaign against Congress party workers and leaders in the past 20 years in Gujarat. 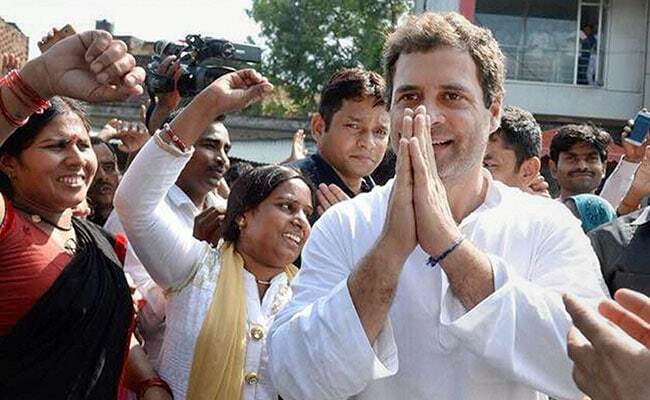 In a funtion in Ahmedabad, Congress President Rahul Gandhi addressed party workers over the Gujarat election verdict. In a speech to the workers, Mr Gandhi said that a new leadership had been created in Gujarat and that the Congress would form the next government in the state. He also said that the Congress manifesto was a historic document. 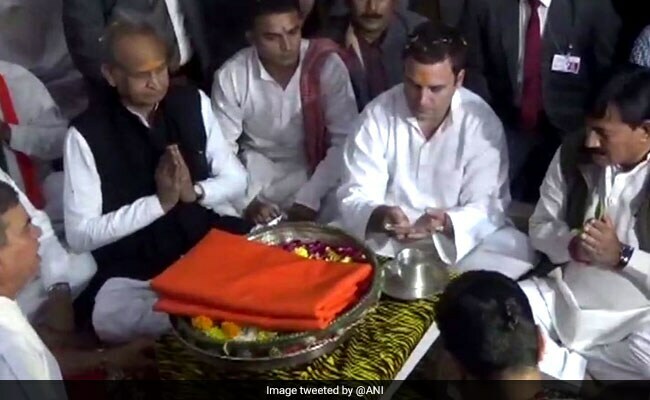 Days after Gujarat election results, in which the Congress performed its best in 35 years, the party's new president Rahul Gandhi offered prayers at the Somnath temple in Gir Somnath district, some 420 km from the state capital Gandhinagar. Later in the day, he will meet the party's state leaders to review and analyse how his party fared in the Gujarat assembly elections. 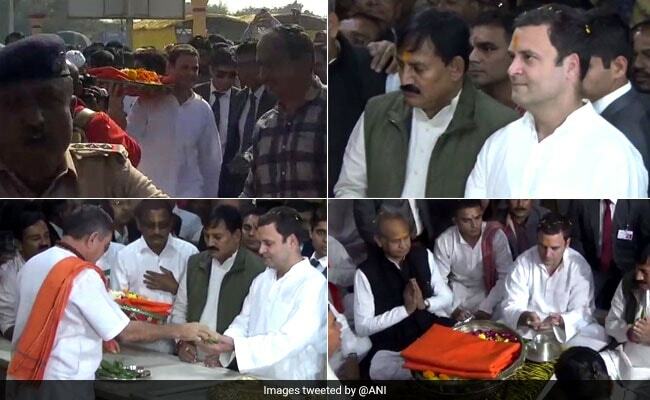 Here are some photographs of Congress president Rahul Gandhi offering prayers at the Somnath Temple in Gujarat. While campaigning in Gujarat before the 2017 assembly election, Rahul Gandhi had visited many temples in the state. 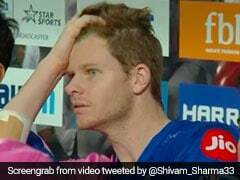 When asked, he had said his family and he are "Shiv bhakts". His opponents had said that his visits to temples in Gujarat were a "political stunt" to garner votes. Mr Gandhi's visit to Gujarat today comes five days after the results for the assembly election were declared. Mr Gandhi chose to begin his day-long visit by offering prayers at the Somnath Temple. 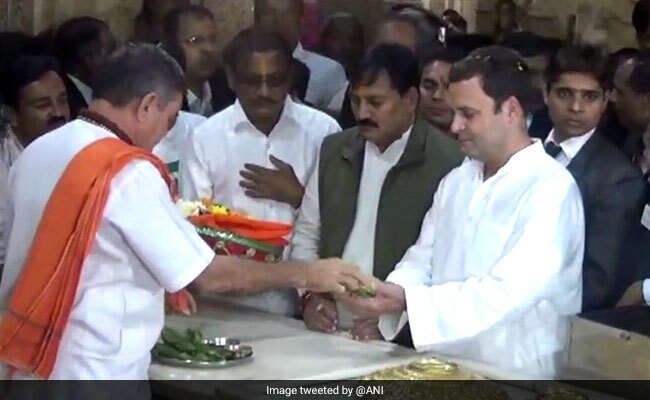 Congress president Rahul Gandhi offers prayers at the Somnath temple in Gujarat's Gir. Mr Gandhi is visiting Gujarat today to assess and review the result of the Gujarat Assembly election. The Somnath temple is located in Prabhas Patan in Gujarat's Saurashtra region. Mr Gandhi, who had visited the temple last during the election campaign for the Gujarat Assembly election, says his family and he are "Shiv Bhakths". He will now visit Ahmedabad, which is approximately 400 km away, to review the result of the recently-held elections in the state. 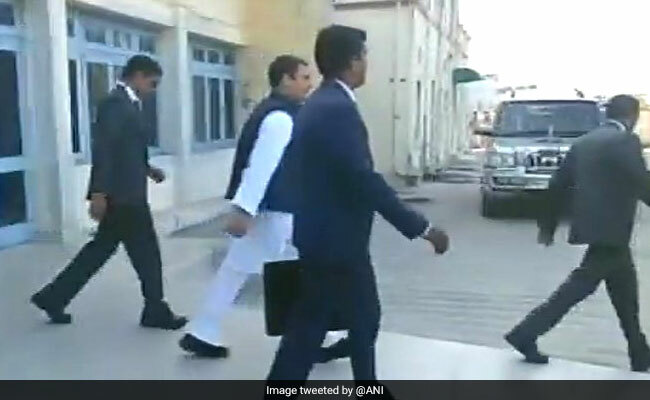 Congress president Rahul Gandhi arrived at Gujarat's Keshod Airport at 10:30 am this morning. He will began the day with a visit to Somnath Temple. 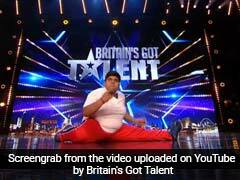 He will now travel to Ahmedabad, which is approximately 400 km from Gir, where the Somnath Temple is located. He will begin review meetings with newly-elected MLAs and party workers starting at 1:30 this afternoon. Rahul Gandhi, who campaigned extensively and aggressively in Gujarat for the Assembly elections, will address a gathering after the 'chintan shivir' (introspection camp). Mr Gandhi will meet newly-elected MLAs as well as leaders from Gujarat's four zones -- north, south, central Gujarat, and Saurashtra -- separately for four hours in Ahmedabad today, before addressing the gathering of party workers in the evening. In the elections, the results for which were declared on December 18, the Congress could not wrest power from the BJP even though its tally increased to 77 seats from 61 last time (2012). During the 'chintan shivir' (introspection camp), Congress leaders and workers in Gujarat have analysed the district-wise election results and will discuss the road-map ahead with party chief Rahul Gandhi in view of the 2019 Lok Sabha election. Rahul Gandhi will meet Congress leaders in Gujarat, who have already begun analysing the election result, to review and get insight about the electoral outcome. Gujarat Congress organised a three-day conclave, which ends today, to study the poll results.